Carbon is a dirty source of energy. But it has also become a dirty word, which is a sad irony indeed. 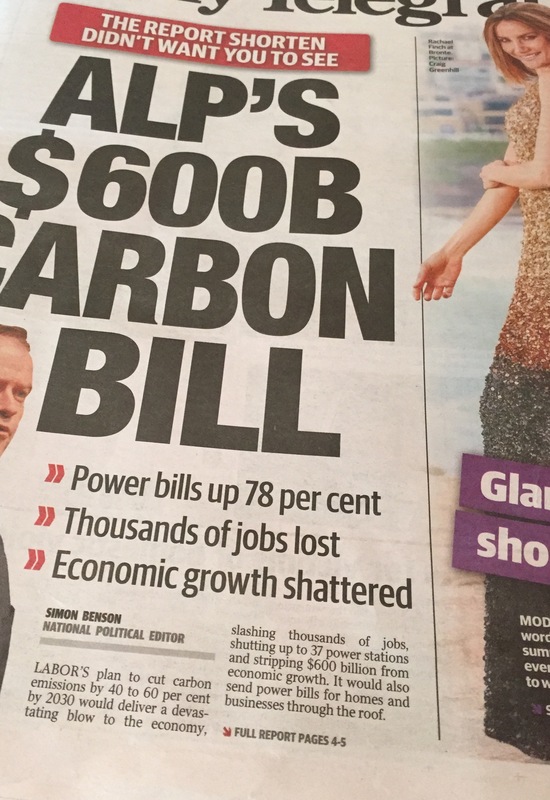 Under the LNP, the word carbon is the signifier that keeps signifying: fear and loathing in the form of the ALP, Bill Shorten, carbon tax, price increases, mass job loss, cost of living pressures, and, the end of the world really. One doesn’t need to read the article and accompanying editorial in today’s’ Daily Telegraph to glean the dire warnings. It’s front page news, delivered right on cue to aggressively counter the release of this morning’s Newspoll figures showing the increasingly secular Abbott government (they’ve lost a Bishop, you see) flagging in the polls, and the devastating (to Abbott’s reputational credentials on climate change) news that President Obama is going to make real action on climate change his legacy policy for generations to come. Even with the wind in its sails, the Shorten opposition must know that it can’t afford to be complacent even for a moment. As I said earlier, the ALP needs to be passionate and creative in how it sells its message on carbon pricing.